This so-called �novelty� antenna is way more than just another auto antenna or a great gift for the fisherman on your list. It�s a way to tell everyone out there that you were born to fish. Take a closer look and you�ll notice all the fine details, from the reel on up to the authentic fishing rod guides. The only thing missing is the water. They are working antennas that fit most vehicles and provide great radio reception. In fact, most people get better reception with this antenna than with their factory one. 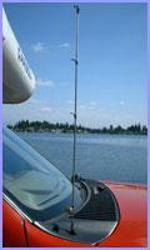 Bottom line: If you fish and you drive, you need one of these unique antennas. Other exterior add-ons from the vendors listed below can be purchased by special order.